In 1998 Congress updated the copyright law with the Digital Millennium Copyright Act with hopes that it provided a forward-looking approach to the rapidly changing technologies affecting movies, music, television, publishing, the artists and all manner of creative endeavors. Among its two key provisions are the Section 512 take-down provisions and the Section 1201 anti-circumvention provisions. Section 1201(a)(1)(A) makes it a crime (and a tort) to “circumvent a technological measure that effectively controls access to a work protected” by copyright. Put another way, if a work protected by copyright is accessed through a digital lock, such as encryption or a digital authentication handshake, then the steps to get around that process violate sec. 1201. The law has some specific exemptions built in for library research, law enforcement, reverse engineering, and encryption research. But these exemptions are highly limited. As a result, Congress also called upon the Librarian of Congress, in consultation with the Register of Copyright to provide a review every three years to publish a list of additional exemptions. The fifth such list has just been published: Section 1201 Rulemaking: Fifth Triennial Proceeding to Determine Exemptions to the Prohibition on Circumvention. A copy of the final rule is here. Literary works distributed electronically – assistive technologies: Literary works, distributed electronically, that are protected by technological measures which either prevent the enabling of read-aloud functionality or interfere with screen readers or other applications or assistive technologies for the blind or persons with a disability under 17 U.S.C. 121. Wireless telephone handsets – software interoperability: Jailbreaking of smartphones – but not tablets – to allow for apps from outside the provider app store. Wireless telephone handsets – interoperability with alternative networks: phone unlocking to allow a handset to be redeployed on another phone network. Motion pictures and other audiovisual works – captioning and descriptive audio: permits the circumvention of motion pictures and other audiovisual works contained on DVDs or delivered through online services to facilitate research and development of players capable of rendering captions and descriptive audio for persons who are blind, visually impaired, deaf, or hard of hearing. In addition to this list, the report specifically identified a number of categories of works that did not earn an exemption. Of greatest note is the ongoing refusal to provide an exemption to circumvent a digital protection measure to obtain a work in the public domain. The Register correctly notes that it is not a violation of section 1201 to circumvent a technological protection measure unless there is a copyright work being sought. Therefore no exemption is required. This is more than parsing language. To create an exemption would suggest an expansion of section 1201 that is unwarranted. As a result, the report that the exemption is not needed provides ample protection to the public. The other significant rejection was the space-shifting of DVD content to devices without DVD players such as iPads and other tablets. The U.S. has been behind Europe in providing that non-physical versions of movies are generally offered in streaming mode rather than download format. The ability to acquire a second format of the same content is also generally sold at a premium price. An exemption to section 1201 would have put significant pressure on the motion picture industry regarding this transition. It is likely that this will become of greater economic and legal importance by the next rule-making. The report also rejected the desire to permit video game console interoperability. Much like the rejection of tablet jailbreaking, the report refused to exempt console jailbreaking so that lawful third-party games could be used on a particular platform. In both instances, the Register rejected the evidentiary record on the matter. There is likely little evidence to be developed because the practice may be quite common and the benefits of enforcement are too limited. The report similarly rejected a desired exemption for jailbreaking computers to allow installation of unauthorized operating systems. This appears to fail for the reasons stated in the other jailbreaking proposals. In contrast to the smartphone app stores, the Register takes the position that the other categories of interoperability limitation have not developed sufficient economic concerns to merit an exemption. Taken together, the rule-making continues to reflect a very conservative, incremental approach to the development of new technology and the appropriateness of anti-circumvention self-help. The Register has made great strides regarding fair use in the educational and documentary filmmaking environments but was probably overly conservative on iPads and tablet computers. As a whole, the report is thoughtful and predictable. The process restarts with each triennial review. In each rulemaking proceeding, the Register and Librarian review the proposed classes de novo. The fact that a class previously has been designated creates no presumption that redesignation is appropriate. While in some cases earlier legal analysis by the Register may be relevant to analyzing a proposed exemption, the proponent of a class must still make a persuasive factual showing with respect to the three-year period currently under consideration. When a class has been previously designated, however, evidence relating to the costs, benefits, and marketplace effects ensuing from the earlier designation may be relevant in assessing whether a similar class should be designated for the subsequent period. As the Register describes the process, it becomes clear how important the evidentiary record and the economic significance of the particular issue must be. Unless Congress has itself shown a preference for a class of users, such as persons with disabilities, the exemptions are limited to very large classes of users. Of course, if you did not get what you wanted, start preparing your petition for rule-making VI – coming in just two years. Known as the DMCA Takedown Provisions, section 512 provide ISPs immunity from copyright liability if the ISP provides an effective method of accepting copyright infringement notice allegations and responds to those notices in a timely manner. Though highly criticized by some organizations, these provisions do not have a triennial review process. Members of the The Center for Professional Responsibility receive a discount on this book. Join the Center or visit the The Center for Professional Responsibility website to learn more about the valuable resources included with your membership. The ABA asks lawyers to volunteer their time and intellectual efforts, only to commercialize those efforts and sell them at a premium. It has policies demanding copyright from its volunteers that limit the dissemination of knowledge and frustrate the values of open access and improvement for the profession. Congress recognized the importance of free access to law. The federal government cannot obtain copyright in works it authors – such as laws and reports – because there is no public benefit. State laws are treated as works in the public domain by case law. Model laws and advisory opinions such as those published here by the ABA are not works in the public domain, so the ABA has every legal right to claim copyright in the works. As a primarily volunteer organization which relies on members time and efforts to create this content, the high prices and limits on access are inconsistent the values of the organization. The irony that a trade professional association dedicated to equal access to justice and the betterment of the profession demands payments for its guidance on how to practice law ethically will not be lost on the public, so why is it lost on the ABA leadership. In contrast to the ABA’s approach, law schools around the country, including Harvard, Birkbeck, and Universidad de Puerto Rico have created open access to scholarly works. Perhaps the most expansive of resources is the Social Science Research Network, a global library of scholarship across most academic disciplines. The ABA should continue to sell sophisticated content to willing purchasers written by volunteer authors. But any reports, opinions, or general information should be free to the public. If we wish to remain a self-regulated profession, then it is time to look past the short-term income opportunities and begin to embrace the ideals of the profession. Northwest Florida State College acknowledged on Oct. 10, 2012 that it has been the subject of a data breach. The announcement explained the attack included “Northwest Florida State College student data on 76,500 current and past students as well as student data on approximately 200,000 Bright Futures scholars across the State of Florida” as well as 3200 employees. The breach seems to have been identified and corrected approximately two weeks prior to this announcement, around Sept. 24th. But the report acknowledges that the break-in began May 21st and continued unabated for three months. The NWFSC student information compromised in the security breach contains public directory information including name and address, as well as confidential student data including birth date and Social Security number. The Bright Futures scholars’ data file includes all State of Florida Bright Futures eligible students during the 2005-06 and 2006-07 academic years. This data file contains student names, Social Security numbers, dates of birth, ethnicity and gender. No student academic files have been compromised. At this point in time, the personal information of employees includes name, birthdate, employee Direct Deposit bank routing and account number information, and Social Security number. Approximately 50 employees to date have reported issues with identity theft, including the college president, faculty and staff. For universities struggling in a weak economy, high tuition, and questions on the return in investment, failures to protect the information of prospective or current students could prove disastrous. Senior university leadership should learn from the obligations under HIPAA and Sarbanes-Oxley to stay very informed and engaged in the security of their students – both offline and online. That the president of the university was personally targeted by the attackers makes the need for diligence even more important. It is also a good reminder that all of us receiving funds via direct deposit need to become more diligent checking our accounts. The university has set up a website at http://www.nwfsc.edu/security/. The 2012 Security Symposium, for the 6th year in a row, will bring together security professionals for a multi-track conference focused on the various aspects of security in information technology today. The symposium will focus on IT security challenges, best practices, and professional discussions, and will include a legal track focusing on the intersection of law and security. The symposium is presented by the Center for Applied Informatics, NKU Chase Law & Informatics Institute and CincyIP. Four hours of Kentucky, Ohio and Indiana CLE credits are anticipated. This conference is free, but space is limited. Register now! This informational track focuses on the understanding and implementation of management policy, procedures, IT audits, continuity planning, and security awareness and training. integrity is being secured by industry ingenuity. Learn the latest methods and tools to process and understand digital evidence. Explore security topics focused around cloud computing, virtualization, mobile, and much more. This year marks the first year with an additional legal track, enabling the legal professionals to engage with security professionals and those involved with implementation of software security. I recently had the opportunity to participate in writing an article for the Journal of Intellectual Property Rights, special issue on Leveraging IP for Business Advantage published in September 2012. The topics range from drug pricing to character licensing, enabling the reader to gain a great understanding of the breadth of intellectual property issues. I was among the articles on entertainment law, with my paper The Heart of the Deal: Intellectual Property Aspects in the Law and Business of Entertainment, Journal of Intellectual Property Rights, Vol. 17, p. 443, 2012. In the globalized media marketplace, intellectual property rights of copyright, trademark, trade secret and identity interests remain the critical building-blocks of property interests and business structures. At the same time, traditional media categories are blurring as projects are increasingly created as transmedia social audience engagement platforms. The entire issue is fascinating and will be useful to lawyers across the globe. My entertainment law article discusses a good many of the issues involved in negotiating intellectual property and production agreements. 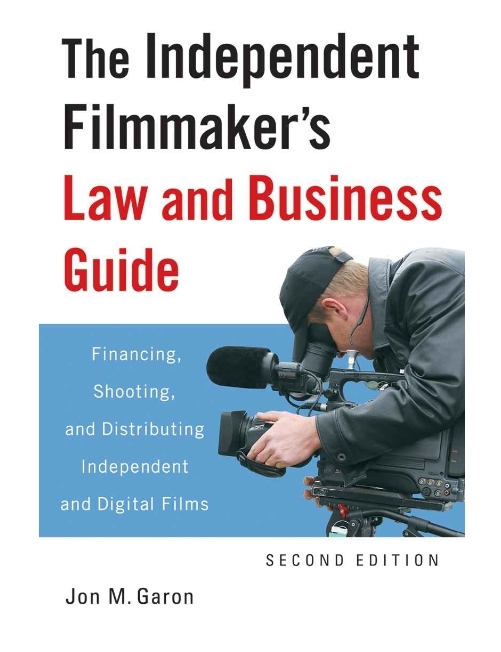 But it is not as complete as an entire book on filmmaking (see The Independent Filmmaker’s Law and Business Guide) since it did not remind filmmakers that they need appropriate film licenses to shoot on public streets. While I have often taught this rule, I was reminded of it earlier this week when four St. Paul Minnesota filmmakers were arrested on “charges of terroristic threats for brandishing what appeared to be real weapons.” The story was reported by Chao Xion of the Minneapolis Star Tribune. It wasn’t until after about nine squad cars screeched into the area and officers had arrested three men and a woman that they learned the truth — the group was filming a low-budget movie. No camera was seen when officers arrived, but a small 35-millimeter camera was later found. Police recovered three guns: a BB gun, an Airsoft gun and a replica gun. [Sgt. Paul Paulos, a police spokesman] said that none of them carried the orange markings of a toy gun and that the situation could easily have turned dangerous. “This could have been a very deadly scene,” he said. Filmmakers are generally required to obtain film permits when shooting in public locations, and of course the making of a film does not give one the right to enter a neighbor’s private property without permission. The police reported that no film permit had been pulled for the filmmaking. As ultra-low budget filming becomes increasingly popular more such incidents are likely to occur. Brandishing a weapon in a public place will raise alarms. Even in one’s own yard, the same scene that will look great on film could precipitate an emergency response. Planning remains one of the most important steps to successful filmmaking, as our local auteurs recently learned.